"Have the courage to say no. Have the courage to face the truth. Do the right thing because it is right! These are the magic keys to living your life with integrity." PROMOTER: Mr. James Wallis At 00447837630064. 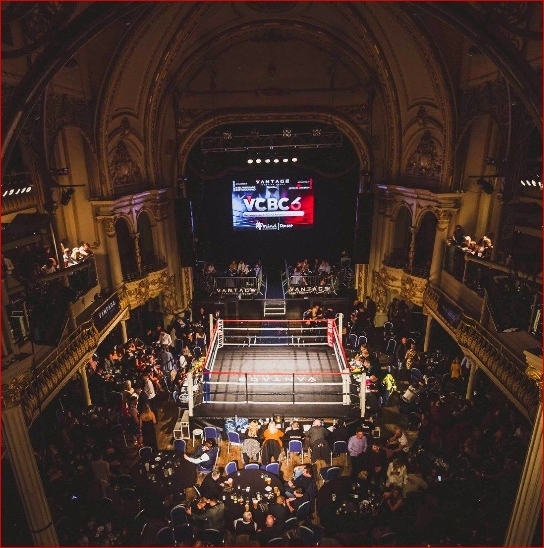 This encounter was straight out of the top drawer as two of Europe's most skilful fighters squared off for the IKF European title. From the first bell the exchanges were fast and furious with neither man giving ground. But it was Kalem John who was stronger and applied more pressure. This came in the form of counter combinations. Abou Ka would deliver a quality three shot combination which John would respond with five or six at a time. Throughout the contest John's counter work rate was higher, and each time Ka attempted to pressure his man, John would catch the kick and counter, or step off and straight back in. 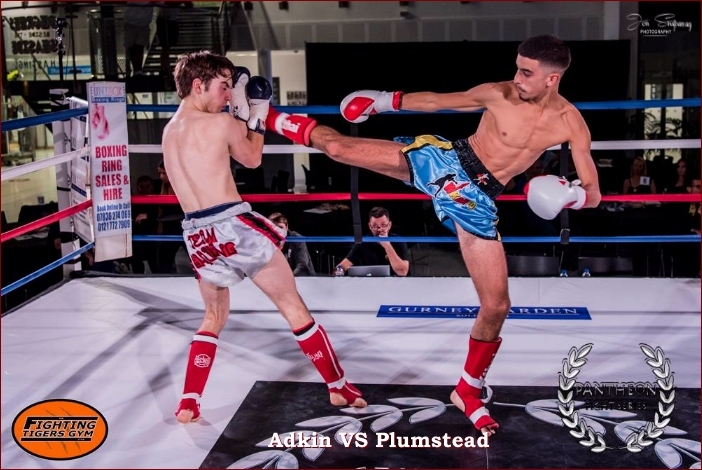 Each round was close but fairly clear as Kalem John built up a commanding lead. Abou Ka knew from the 4th round that he needed a stoppage and applied pressure accordingly. But John went with him and simply stepped up a gear to finish the contest as clear winner and new Champion! WINNER: Kalem John by unanimous decision, 50-45, 50-45 & 50-45. WINNER: Tobias Harilla by KO at 1:25 of round 1. Phil Raeburn has been issued a 45 day ISCF Medical Suspension until 22nd January 2019. WINNER: James Lilley by unanimous decision, 30-27, 30-27 & 30-27. WINNER: Alend Bendy by TKO At 1:58 of round 3. Craig Howells has been issued a 30 day ISCF Medical Suspension until 7th Jan 2019. WINNER: Issac Downs by TKO at 1:35 of round 1. WINNER: Ishan Borz by TKO at 1:37 of round 1. Cameron Douglas has been issued a 30 day ISCF Medical Suspension until 7th January 2019. WINNER: Louis Waroquiez by unanimous decision, 30-27, 30-27 & 30-27. WINNER: Jarad Khan by unanimous decision, 30-27, 30-27 & 30-27. WINNER: Ashleigh Johnson by unanimous decision 29-28, 29-28, 29-28. WINNER: Connor Davies by KO at :23 seconds of round 1. WINNER: Dean Thomas by corner retirement at the end of round 2. WINNER: Levi Griffiths by unanimous decision, 30-26, 30-26 & 30-26. 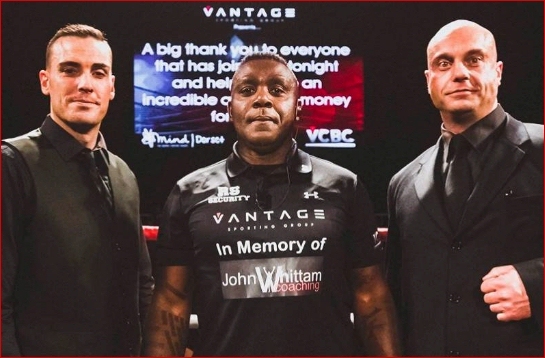 "Vantage Charity Boxing Challenge 6"
defeated Jason Wheeler (Bournemouth, England, 13-4, 74.4kg, 5'8", 10-2-81, John Orchard, 00447809707048) by TKO at :21 seconds round 2. 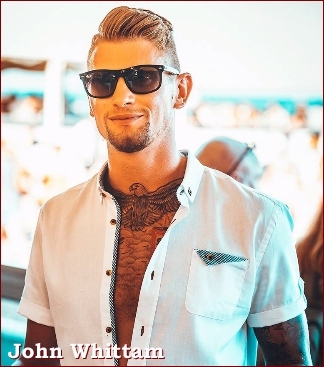 Jason Wheeler receives a 30 day IAB medical suspension until 31st December 2018. This encounter was never going to last more than a couple of rounds. It was just a question of who got tagged first. 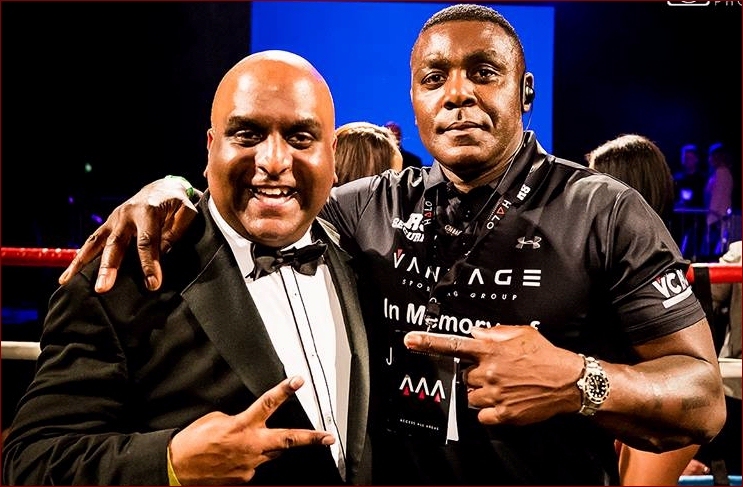 Both men were huge punchers with big stoppage records so at the opening bell, the whole (packed) house were focussed on the ring. Wheeler came out in his usual explosive fashion looking for a quick finish. During a long career he has never been interested in overtime, and it took Lukascyk a short time to adjust, before throwing his own bombs. Both fighters were rocked but remained unaffected until a huge right hand staggered Wheeler. The follow up forced a count, which was well needed. Wheeler cleared his head and threw caution to the wind as he dropped bombs with both hands. Lukascyk was having none of it, and showing a granite chin he stood and traded, sending Wheeler to the canvas again. He was up at 8 and relieved to hear the bell. Coming out for the second there was no hesitation and both men clashed again in the centre of the ring. 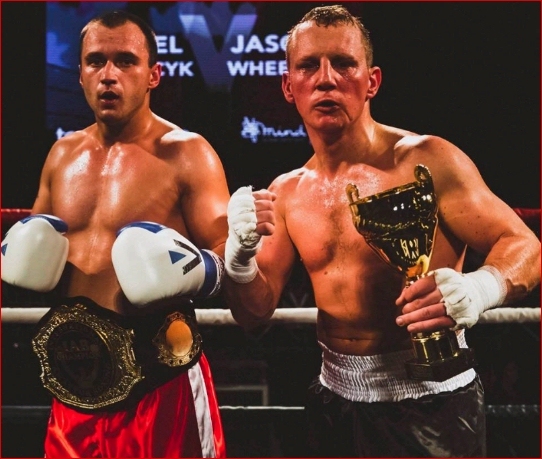 Lukascyk dominated and Wheeler, who still looked to be on wobbly legs took another right hand, again sending him to the canvas. Referee Pete Richardson immediately called it off. Wheeler staggered up wanting to continue but the call was the correct one. 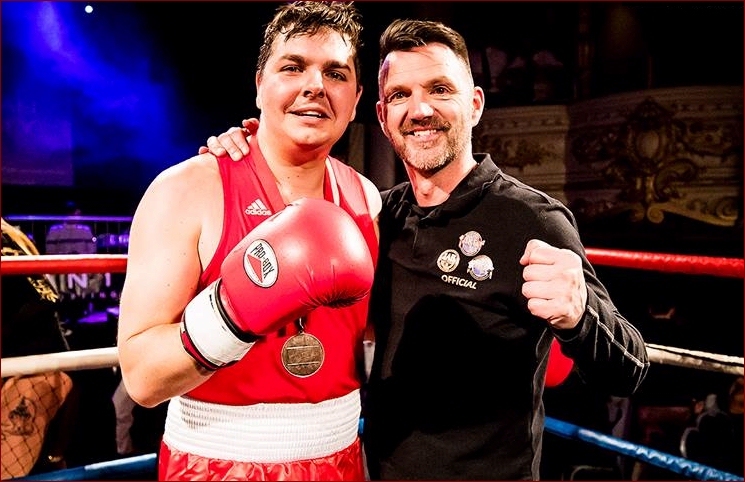 Pawel Lukascyk was crowned new IAB Southern Area Champion! 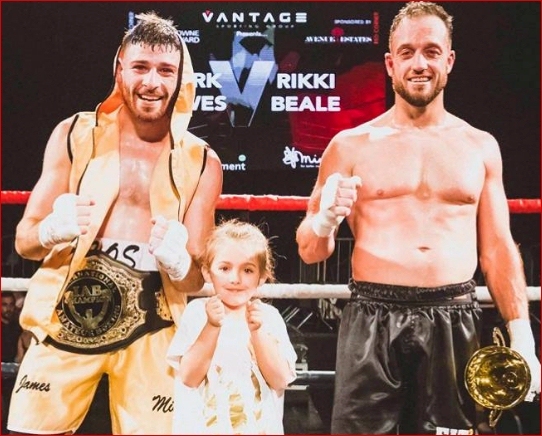 defeated Rikki Beale (Wareham, England, 10-3-1, 72.2kg, 5'10", 7-20-84, John Orchard, 00447912291247) by unanimous decision, 49-47, 49-46 & 49-46. This encounter had been a long time coming. 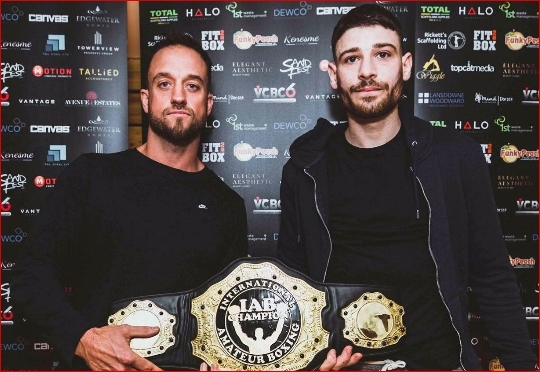 Both fighters have been good servants to the game and with former champion James Naylor vacating, this was the perfect opportunity to pitch them together for a meaningful match up. From the outset Rawes looked smooth and confident whilst Beale tried to pile on the pressure and close down his opponents attacks. For the main part Beale played second fiddle, being beaten to the punch, although when he did connect he looked dangerous. Rawes knew that trading was too dangerous and his footwork was probably the best we have seen from him. Beale became frustrated as he was tagged, but never stopped trying to pull the action into the trenches. 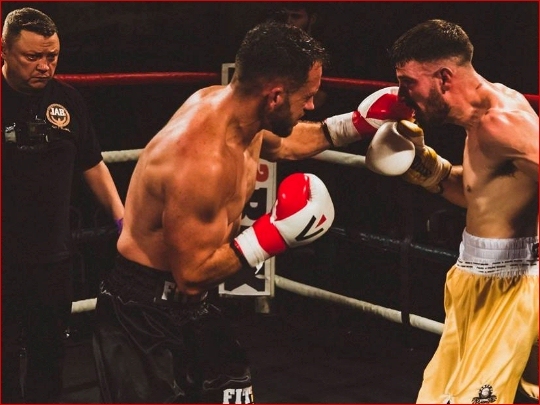 But Rawes was having none of it, and although some of the round were close it was Rawes who had control, eventually running out a unanimous decision winner! 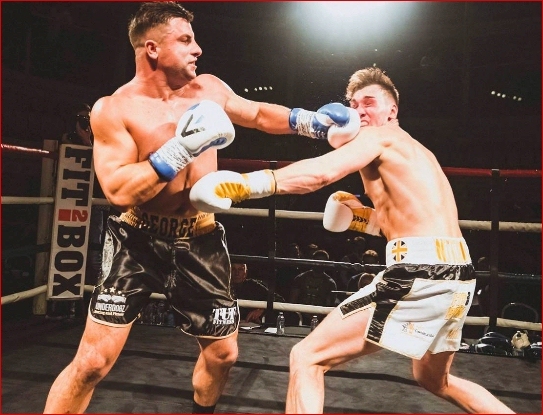 defeated George West (Blandford, England, 1-1, 85kg , 5'9", 7-22-89, Shane Cooper, 00447985720996 ) by split decision 38-37, 38-37, 37-38.
defeated Adam Kowalewski (Bournemouth, England, 0-2-1, 86.5kg, 5'9", 11-9-80, Ty Browne, 00447739792079) by majority decision 40-36, 38-38 & 39-37.
defeated Adam Muncaster (Bournemouth, England, 6-6, 70.2kg, 5'11", 10-2-2000, Geoff Lewis, 00447701009539) by split decision 40-36, 39-38 & 37-39.
defeated Jim Crossin (Poole, England, 0-1, 78.2kg, 5'10", 2-7-91, Shane Cooper, 00447985720996) by unanimous decision 40-36, 40-36 & 39-37.
defeated Sarah Jane Letcher (Lymington, England, 0-0, 65.5kg, 5'6", 7-17-92, John Orchard, 00447834286085) by unanimlous decision 30-27, 30-27, 30-27.
and Resh Mohangee (Ferndown, England, 0-0-1, 60kg, 5'4", 08-08-83, John Orchard, 00447834286085) fought to a Draw 29-29, 30-27 & 28-29.
defeated Adam Newman (Bournemouth, England, 0-4, 89.5kg, 6'3", 5-17-90, John Orchard, 00447834286085) by unanimous decision 30-27, 30-37 & 29-28.
defeated Luke Lowe (Ringwood, England, 0-1, 65.5kg, 5'10", 3-20-00, Dan Lockwood, 00447391497161) by majority decision, 29-28, 29-28 & 28-28.
defeated James Blackshaw (Christchurch, England, 0-1, 80.5kg, 5'11", 6-27-84, Jay Collins, 01202294223) by TKO at :43 seconds of round 2. 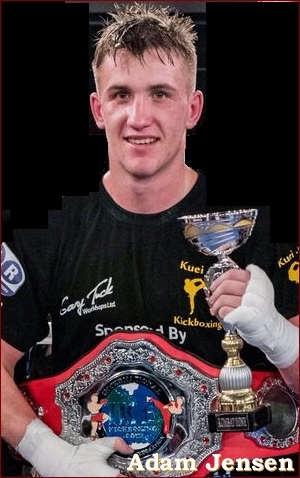 James Blackshaw receives an IAB medical suspension until 31st December 2018.
defeated Sam Davies (Bournemouth, England, 0-1, 70kg, 5'10", 1-22-89, Jay Collins, 01202294223) by TKO at :58 seconds of round 1. 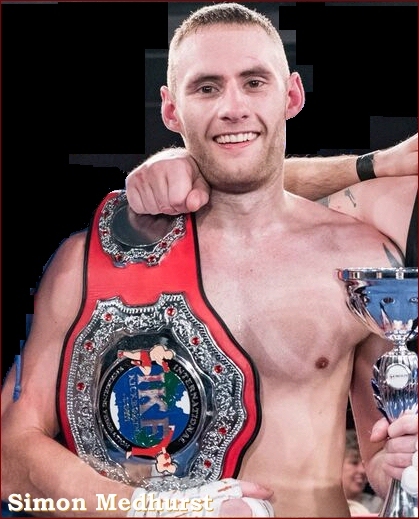 Sam Davies receives a 30 day IAB medical suspension until 31st December 2018.
defeated Michelle Keehan (Christchurch, England, 1-1, 69.5kg , 5'8", 1-14-83, Jay Collins, 01202294223) by unanimous decision, 30-27, 30-27 & 30-27.
defeated Georgina Galton (Bournemouth, England, 0-1, 63.2kg, 5'8", 5-3-96, John Orchard, 00447834286085) by majority decision, 29-29, 30-28 & 29-28.
defeated Dave Trim (Wareham, England, 2-1, 71.0kg, 5'6", 7-21-85, Shane Cooper, 00447895720996) by unanimous decision, 30-26, 30-27 & 30-26.
defeated Ethan Roff (Wareham, England, 0-2, 83kg, 5'9", 12-31-99, Kris Cann, 00447980743780) by unanimous decision, 29-28, 29-28 & 29-28.
and Rich Wandowski (Bournemouth, England, 1-0-1, 82.0kg , 6', 9-10-88, John Orchard, 00447834286085) fought to a draw 28-28, 28-28 & 28-28.
defeated David Sturgess (Bournemouth, England, 0-1, 84kg, 6'1", 3-4-88, Jay Collins, 01202294223) by unanimous decision, 30-27, 30-27 & 30-27.
defeated Lisa Owen (Blandford, England, 2-2, 60.0kg, 5'2", 8-10-79, Shane Cooper, 00447985720996) by unanimous decision, 30-27, 30-27 & 30-27.
and Kenny Vaughan (Christchurch, England, 0-1-1, 99.9kg , 6', 4-3-86, John Orchard, 00447834286085) fought to a split decision draw, 29-30, 29-29 & 29-28.
defeated Wayne Ford (Poole, England, 1-1, 92.0kg , 5'10", 10-15-69, Shane Cooper, 00447444200926) by TKO at 1:17 of round 2. 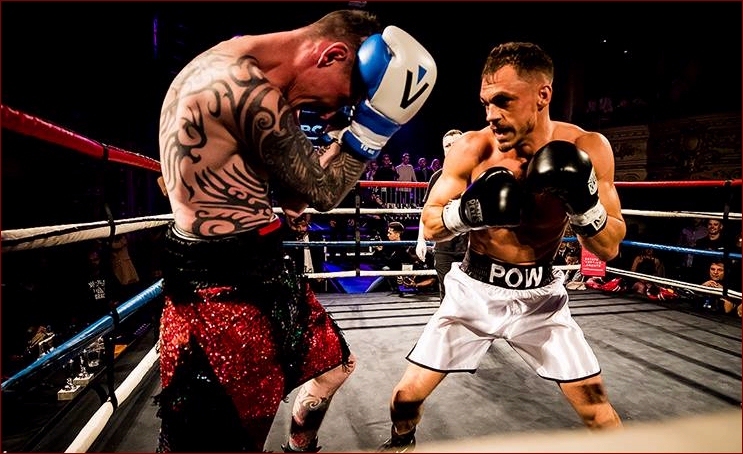 Wayne Ford receives a 30 day IAB medical suspension until 30th December 2018.
defeated Zack McKay (Bournemouth, England, 0-1, 77.7kg, 6', 8-30-90, Jay Collins, 01202294223) by unanimous decision, 28-26, 28-26 & 28-26.
defeated Sam Sisodia (Bournemouth, England, 1-2, 71.2kg, 5'8", 11-20-93, Shane Cooper, 00447444200926) by unanimous decision, 30-26, 29-27 & 29-27.
defeated Licinio Menezes (Bournemouth, England, 0-1, 75.0kg, 5'9", 3-11-00, Paul Gilman, 00447734575718) by unanimous decision 30-27, 29-28 & 29-28.
defeated Leon Clarke (Poole, England, 0-1, 78.2kg, 5'11", 10-25-01, Shane Cooper, 00447985720996) by unanimous decision, 30-25, 30-25 & 30-25.
and Dan Wale (Poole, England, 0-0-1, 104.8kg, 6'3", 3-24-91, John Orchard, 00447834286085) fought to a draw, 28-28, 28-28 & 28-28.
and Joe Heron (Christchurch, England, 1-2-1, 72kg, 5'11", 1-27-99, John Orchard, 00447834286085) fought to a Majority Draw, 30-26, 28-28 & 28-28.
defeated Adam Neesam (Poole, England, 1-4-1, 73.5kg, 5'11", 8-20-92, Martin Pepper, 00447739390911) by Majority decision, 29-29, 29-29 & 29-28. PROMOTER: Mr. Andy Chambers At 00447739390911. WINNER: Olli Thompson by corner retirement (Cut). End of round 1. WINNER: Ben Taylor by corner retirement end of round 4. Atul Brooker receives a 30 day IAB medical suspension until 5th November 2018. This title contest did not take place due to Ola Wolfe failing to make weight. Belt awarded to Seb Hallett on the scales. WINNER: Iony Lawrence by split decision, 49-47, 46-49. 49-47. RESULT: Draw 28-29, 29-29, 29-28. WINNER: Karl Trott by TKO 1:38 round 3. Jareth Mansfield receives a 30 day IAB suspension until 5th November 2018. WINNER: Terry Davies by unanimous decision 30-25, 30-25, 30-25. WINNER: Solomon Jenner by KO 1:53 round 3. Dom Mardel receives a 45 day IKF medical suspension until 20th November 2018. WINNER: Mehdi Jadouni by split decision 29-28, 28-29, 29-28. WINNER: Stacey Cooper by TKO 1:14 round 2. Ahadia Bula receives a 30 day IKF medical suspension until 5th November 2018. WINNER: Anas Begdouri by TKO 1:13 round 3. Saraak Quinalt receives a 30 day IKF medical suspension until 5th November 2018. 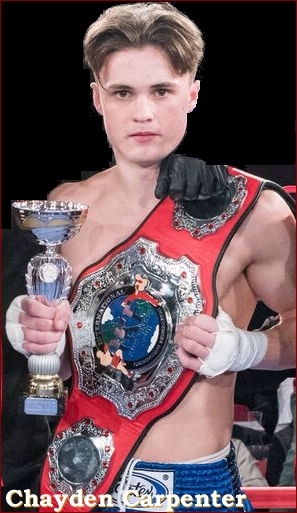 "KOMBAT ZONE INTERNATIONAL KICKBOXING & K1"
WINNER: Thomas Dourel by KO at 1:29 of round 1. Connor George has been issued a 45 day IKF Medical Suspension until 17th October 2018. 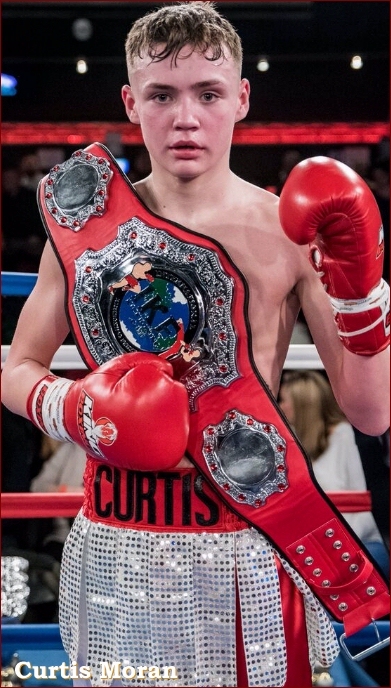 WINNER: Chayden Carpenter by unanimous decision 49-45, 49-46, 49-47. RESULT: Majority Draw, 28-29, 29-29, 29-29. RESULT: Majority Draw, 29-29, 29-29, 30-28. WINNER: Lilly Anderson by unanimous decision, 30-27, 30-28, 30-27. 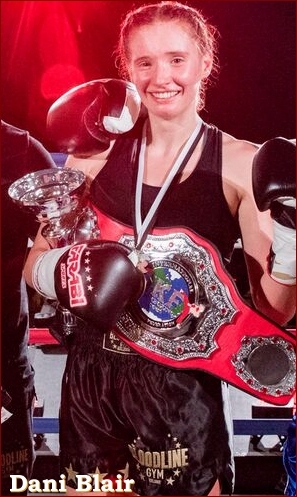 WINNER: Cari - Anne Steward by retirement at :43 seconds of round 1. Mollie Tighe has been issued a 30 day IKF Medical Suspension until 2nd October 2018. WINNER: Jay Taylor by majority decision, 30-27, 29-29, 30-27. WINNER: Nick Lelliot by majority decision, 29-26, 29-27, 28-28. WINNER: Jonathan Davis by split decision, 29-28, 30-28, 27-30. WINNER: Luke Wallace by unanimous decision, 30-27, 30-27, 30-27. WINNER: Stacey Cooper by unanimous decision, 30-27, 29-28, 30-28. WINNER: Tyler Sharp by unanimous decision, 30-27, 30-27, 30-27. WINNER: Daniel Vortian by unanimous decision, 30-26, 30-26, 30-26. RESULT: Split Decision Draw, 29-28, 28-30, 29-29. WINNER: Judd Button by unanimous decision, 30-27, 30-28, 30-28. WINNER: Ayoub Abdelkaer by split decision, 27-28, 28-27, 28-27. Shaun Pickford has been issued a 45 day IAB Medical Suspension until 17th October 2018. WINNER: Jordan Cornford by unanimous decision, 30-25, 30-26, 30-26. Of The California State Athletic Commission! Second-day weigh-ins for championship fights, to be held on fight day. Championship participants are not to gain more than 10% of the contracted weight. The champion would be stripped of the title, whereas the challenger would be rendered ineligible to win the title. 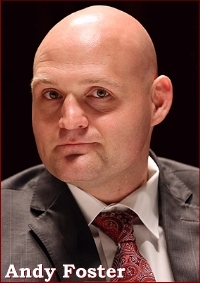 Reduction in ranking status for first offense. Outright removal from the rankings of the major sanctioning bodies for a full year if they are a repeat offender. Check out more details at The 3:05 Mark Of The Clip Below. PROMOTER: Mr. Lee Eaton At 07876 238286. WINNER: Josh Cavey by TKO at 1:51 of round 1. Andrew Ship has been issued a 30 day IKF No Competition Medical Suspension until 2nd July 2018. 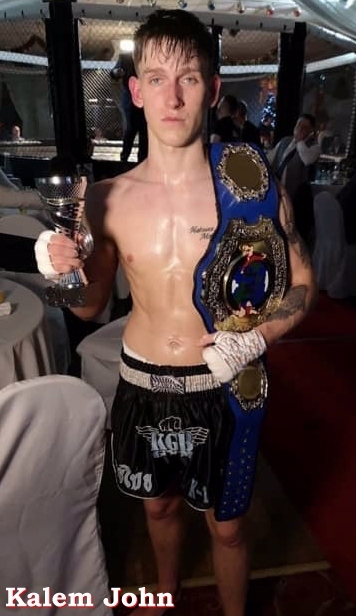 WINNER: Liam Ansell by unanimous decision, 30-27, 30-27, 29-28. WINNER: Amber Thomson by unanimous decision, 30-27, 29-28, 29-28. WINNER: Alex Collins by majority decision, 29-28, 29-29, 29-28. WINNER: Harry Dickinson by majority decision. WINNER: Morgan Towner by TKO at :43 seconds of round 2. Josh Miller has been issued a 30 day IKF No Competition Medical Suspension until 2nd July 2018. RESULT: Split Decision Draw 28-30, 30-27, 29-29. WINNER: John Stewart by KO at :57 seconds of round 1. Brin Wallace has been issued a 45 day IKF No Competition Medical Suspension until 17th July 2018. WINNER: Ash Cole by unanimous decision, 30-26, 30-26, 30-27. WINNER: Logan Smith by TKO at :45 seconds of round 2. Josh King has been issued a 30 day IKF No Competition Medical Suspension until 2nd July 2018. WINNER: Damian Starmer by TKO at 1:53 of round 2. Richard Childs has been issued a 30 day IKF No Competition Medical Suspension until 2nd July 2018. WINNER: George Buckell by corner retirement at the end of round 1. Dean Clarke has been issued a 30 day IKF No Competition Medical Suspension until 2nd July 2018. WINNER: Harry Cotton by corner retirement at the end of round 1. Marc Apps has been issued a 30 day IKF No Competition Medical Suspension until 2nd July 2018. RESULT: Majority draw, 28-28, 29-27, 28-28. WHERE: Low Grange Social Club Billingham, England. 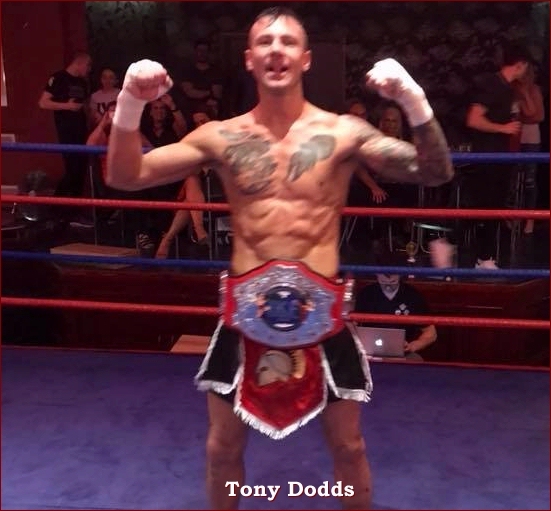 We were fortunate to witness probably the best contest of the year so far, as Tony Dodds stepped into the ring to face Martin Eglington for the vacant IKF British Welterweight title (recently vacated by Scott Pederson). 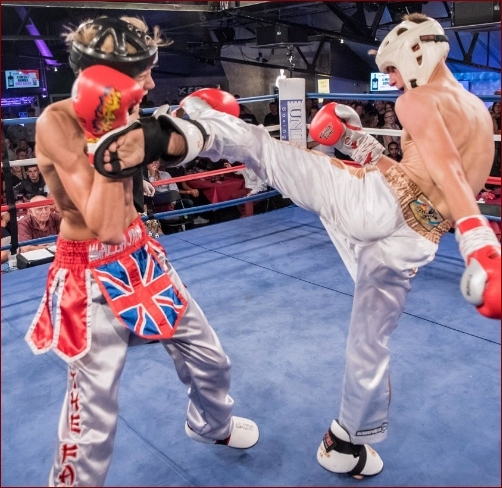 The contest began at a blistering pace with Eglington unloading powerful low kicks. Although these had effect, Dodds looked un-phazed as he settled into his work. It was clear that Eglington had the strength and you had to guess that the shots would begin to take their toll quite early. Eglington took the first round on all the cards but in the second Dodds seemed to step up a gear to meet him. They absolutely matched each other blow for blow, with Dodds beginning to string combinations together. Although Eglington scored the stronger techniques and it seemed only a matter of time before Dodds would start to hurt. An even type of second round set things up for the third. Both men had expended a lot of energy so this is where you would see the cracks starting to appear. 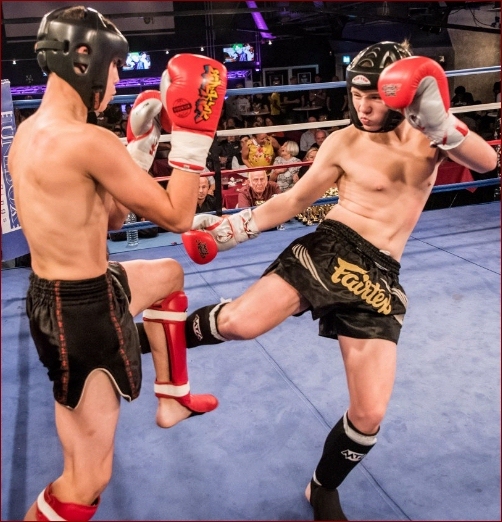 Eglington had decided on a finish and slammed in the low kicks, But Dodds was now working his punch combinations. A knee exchanged was followed by some sweet body punches and Eglington was down. He made the count but was in some difficulty as Dodds moved in to finish the contest. 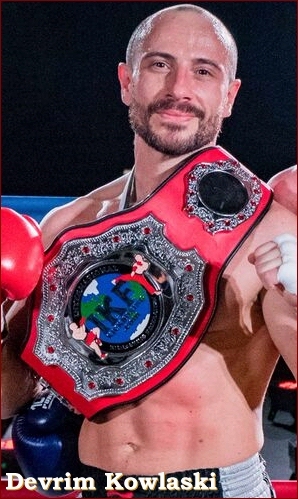 An absolutely fantastic title contest with two worthy challengers, but only one winner as Tony Dodds emerged the champion with a spectacular stoppage. WINNER: Tony Dodds by KO at 1:32of round 3. Martin Eglington receives a 45 day IKF medical suspension until 31st May 2018. 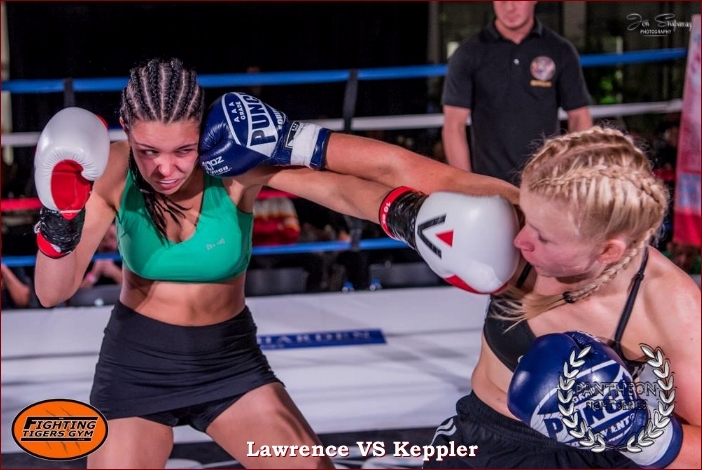 Louise Walker came out fast for this title contest with some fantastic punch combinations. Danielle Hindmarsh was clearly a kicker and took a little while to settle into her game and find her range. But once this was established the contest became one of two styles. Kicker V Puncher. When Walker unloaded she gave Hindmarsh all sorts of trouble. But she failed to put her kicks together leaving Hindmarsh to find her range and keep a distance, and a level of control. Walker was definitely the aggressor but that really wasn't enough as the effective kicking from Hindmarsh, often on the back foot, racked up the points. 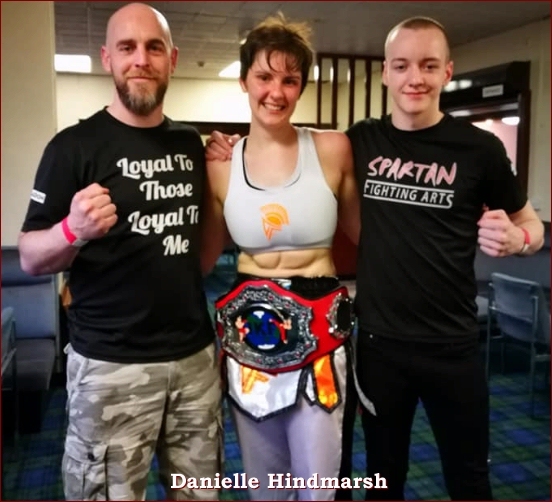 Whilst the judges were split across the rounds at times, all three agreed that the new champion by unanimous decision was Danielle Hindmarsh. WINNER: Danielle Hindmarsh by unanimous decision, 49-46, 50-45, 48-47. 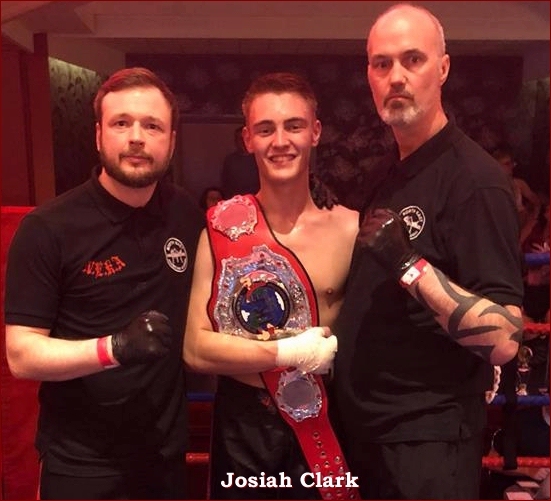 Undefeated Lee Hamilton came to make a statement in this IKF Area title clash but was soon found wanting by current champion Josiah Clark, who oozed class from the outset. An early head clash put the bout in jeopardy but both men handled it well and they were soon back into the action. Clark unleashed an early head kick forcing a count. Hamilton was up early and ready to continue but Clark then switched to the body dropping Hamilton for the full count, and a quick retention of his title. WINNER: Josiah Clark by KO 1:23 round 1. WINNER: Saran Hill by unanimous decision, 30-27, 30-27, 30-27. WINNER: Issac Long by unanimous decision, 30-27, 30-27, 30-27. WINNER: Kristof Blaszk by TKO at 1:59 of round 1. Glen McKenzie receives a 30 day IKF medical suspension until 21st May 2018. WINNER: Jake Fairless by unanimous decision, 30-27, 30-27, 29-28. WINNER: Josh Spence by majority decision, 29-27, 28-28, 29-28. WINNER: Adam Hepple by TKO at 1:28 of round 2. Tolik Andrejers receives a 30 day IKF medical suspension until 21st May 2018. WINNER: John Alton by majority decision, 28-28, 29-28, 29-28. WINNER: Ryan Forth by unanimous decision, 30-27, 30-27, 30-28. WINNER: Martin Hansell by unanimous decision, 30-27, 30-27, 30-27. WINNER: Jorgie Fuller by split decision, 29-28, 29-28 28-28. WINNER: Natalia Thompson by TKO at 1:17 of round 1. Gemma Hansell receives a 30 day IAB medical suspension until 21st May 2018. 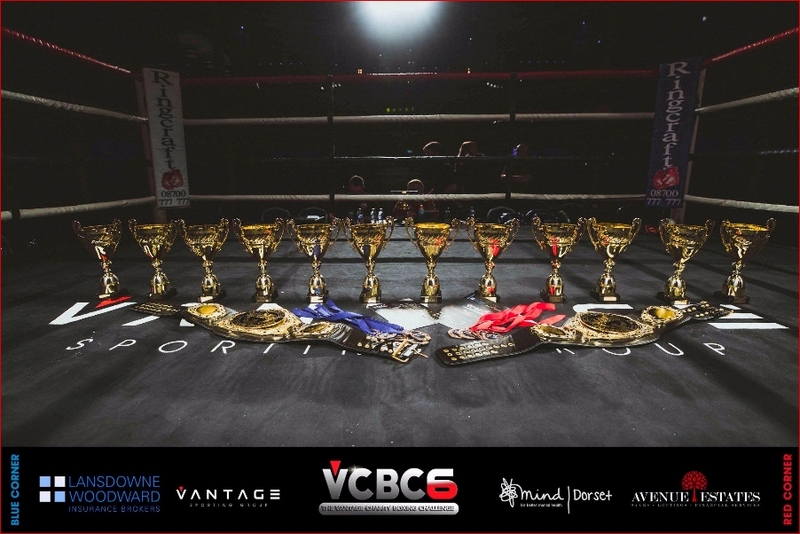 "Vantage Charity Boxing Challenge 4"
The VCBC has gathered huge momentum during the last 12 months, and tonight was no exception. 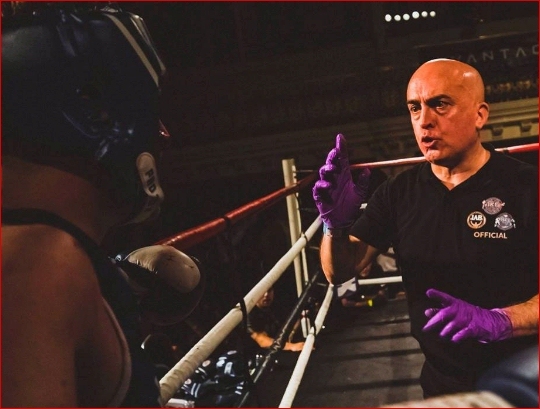 The brands attention to detail in terms of matching, safety and care for competitors is unequalled in the White Collar sector, in fact probably in any combat sport sector. 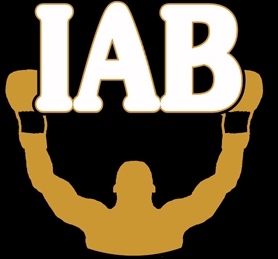 Their work with the IAB has moved the sport forward hugely. Once again they played to a full house in Bournemouth, with not a single ticket spare. 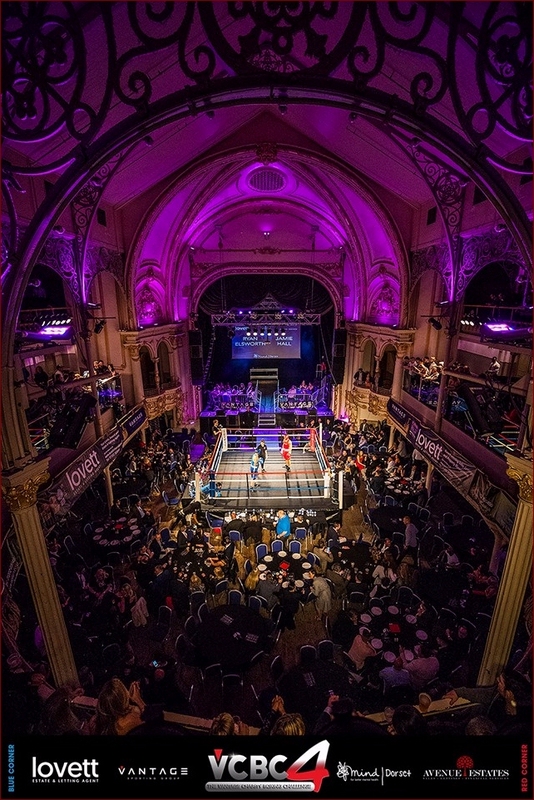 Every seat, every standing space, every guest list entry was filled for this opening event of 2018 with approximately 1200 in attendance. 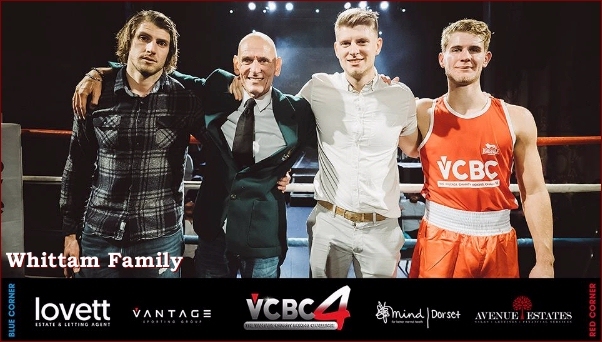 This time there was an added interest, and indeed sadness as the the brand celebrated the life, and mourned the death of former IKF Champion and treasured VCBC coach John Whittam, who tragically passed at the end of last year. The VCBC Charity for 2018 is Dorset MIND, who support mental health issues around the UK with fantastic work. The target raise for this event was £10,000. At the time of writing the total has reached just under £20,000 which is an unbelievable achievement. The team now move on to the next Bournemouth date in June along with a plan to roll the concept out alongside the IAB across the UK, starting in Hastings, also in June. 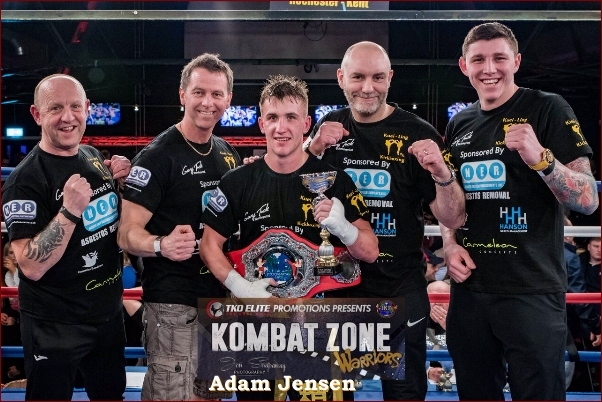 Whittam won this IKF Title on April 11th, 2010 when he defeated James Penny (TS Kick- Stevenage) by corner stoppage in round 4. 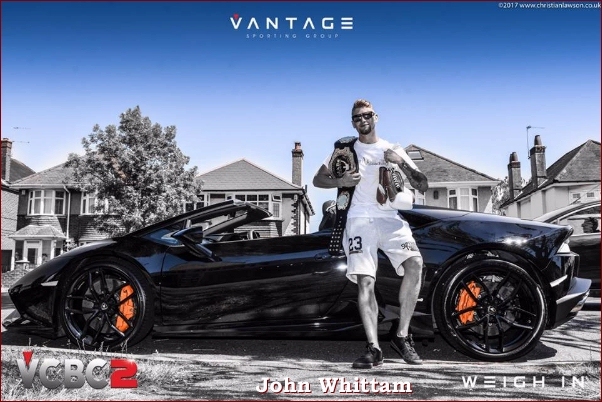 Whittam won his title on May 9th, 2010 in Rochester, Kent, England when he defeated John Lawton by Split decision 50-46, 47-50, 50-46. 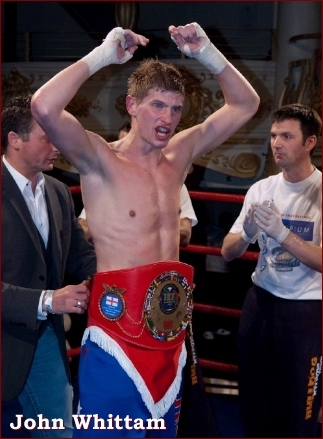 November 28th, 2010 - Amadeus, Rochester, Kent, England: Defeated Bradley Collins by majority decision, 50-46, 48-48, 49-46. 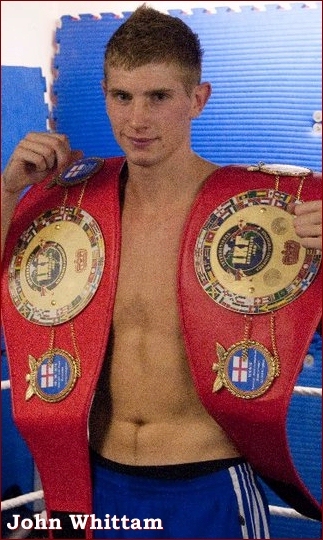 March 26th, 2011 - Lincoln, England: Defeated John Lawton by TKO in round 4. John Whittam training for his IKF European Title. Dean Worth receives a 30 day IAB medical suspension until 23rd April 2018. WINNER: Jason Wheeler by KO at :28 seconds of round 1. Stan Hutton receives a 45 day IAB medical suspension until 8th May 2018. WINNER: Maly Elaamour by split decision, 38-39, 39-37, 39-37. WINNER: Scott Rowley by corner retirement end of round 3. Adam Neesam receives a 30 day IAB medical suspension until 23rd April 2018. WINNER: Shereen Woodrow by TKO at 1:23 of round 3. Anna Sparks receives a 30 day IAB medical suspension until 23rd April 2018. WINNER: Matt Bell by unanimous decision, 30-26, 30-26, 30-26. WINNER: Charlie Young by unanimous decision, 30-26, 30-26, 30-26. WINNER: : Adam Lopez by unanimous decision, 30-27, 30-27, 30-27. WINNER: Ryan Elsworth by majority decision, 29-29, 30-28, 30-28. WINNER: Dan Whittam by unanimous decision, 29-28, 29-28, 30-27. WINNER: Daniel Titheridge by corner retirement at end of round 2. Chris Geddes receives a 30 day IAB medical suspension until 23rd April 2018. 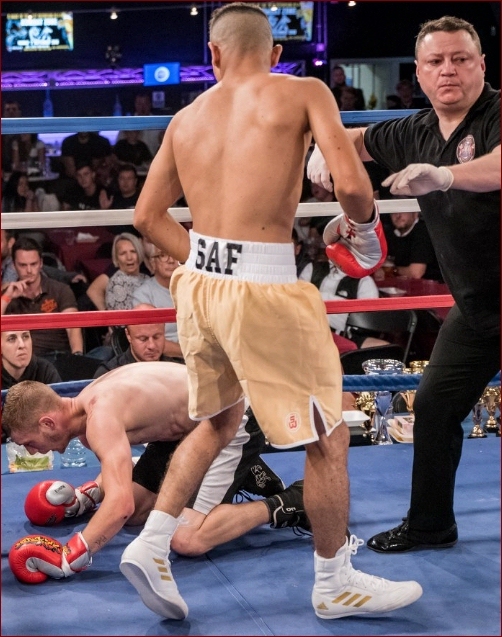 WINNER: Siaf Sepahi by unanimous decision, 30-27, 30-27, 30-27. WINNER: Sherren Hayward by TKO at 1:04 of round 2. Poria Haiabrahim receives a 30 day IAB medical suspension until 23rd April 2018. 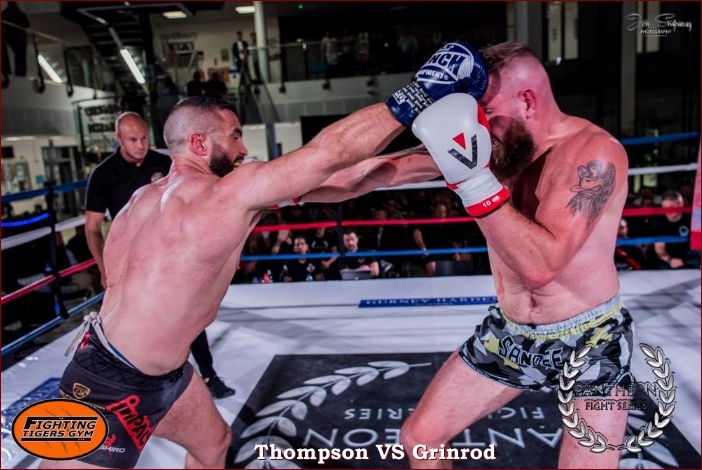 WINNER: Dave Trim by unanimous decision, 29-28, 29-28, 20-27. WINNER: Sam Hayward by unanimous decision, 30-27, 30-27, 30-27. WINNER: Ryan Ball by split decision, 30-27, 29-28, 28-30. 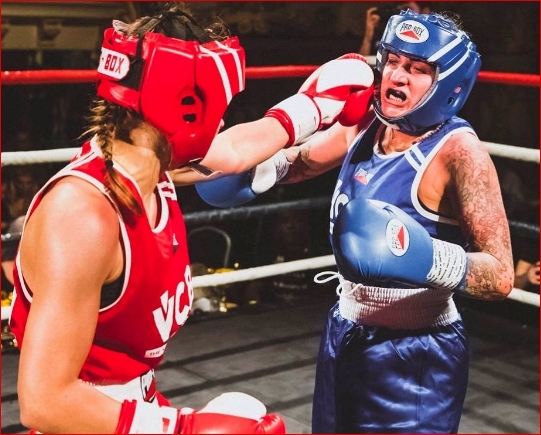 WINNER: Jade Webb by RSF at :58 seconds of round 2. Stace Trim receives a 30 day IAB medical suspension until 23rd April 2018. WINNER: Dan Neal by unanimous decision, 30-27, 30-27, 30-27. WINNER: Thomas Krabowaik by split decision, 30-27, 29-28, 28-30. WINNER: Shwe Voller by split decision, 29-28, 29-28, 28-29. Andrew Daniels receives a 30 day IAB medical suspension until 23rd April 2018. Steve Miles receives a 30 day IAB medical suspension until 23rd April 2018. WINNER: Dan Long by corner retirement end of round 1. Nathan Stuart receives a 30 day IAB medical suspension until 23rd April 2018. WINNER: Tom Mitchard by corner retirement end of round 1. Reece Buttree receives a 30 day IAB medical suspension until 23rd April 2018. WINNER: Rondel Carrington by unanimous decision, 29-27, 29-27, 30-27. WINNER: Lewis Younger by unanimous decision, 29-27, 29-27, 29-27. WINNER: Michael Pursey by unanimous decision, 29-28, 29-28, 29-28. Sarah Worsfold embarked on what was to be a career defining performance against the UK number 1 and World Champion Claire Clements. 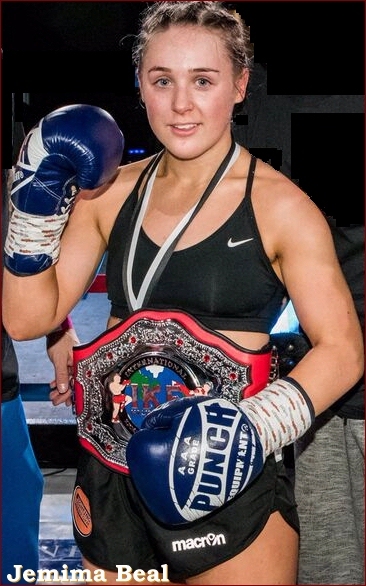 Worsfold arrived as the highly decorated amateur champion, and with few opponents either available or willing to face her, she stepped straight into a shot at the IKF European title. From the outset she made her intentions clear to take immediate control of the contest. But Claire Clements is not the number one ranked fighter for nothing and had answers to most of Worsfolds work. The low kick exchanges were vicious but it was Worsfolds punch combinations that controlled the action. Clements seemed a little flat footed as she struggled with the pace and by the 3rd round Worsfold was in control with her opponents left side (leg and body) taking plenty of shots and beginning to bruise up. A spinning back fist landed on Clements but she remained steadfast and unfazed. You had to think that she had something to unleash at any moment but Worsfold was unconcerned and continued to drop in solid low kicks. You could see that she was also affected by low kicks but she was not to be denied. A heavy close up exchange in the 4th saw Clements emerge with a cut. She signalled that she had been butted but this seemed unlikely to be deliberate. However, a quick inspection and away we went again with no more complaining. To finish Worsfold opened up in the final round to make sure that here first visit to the paid ranks was one that people would remember. It was certainly that as she emerged as the champion, winning every round on every card! 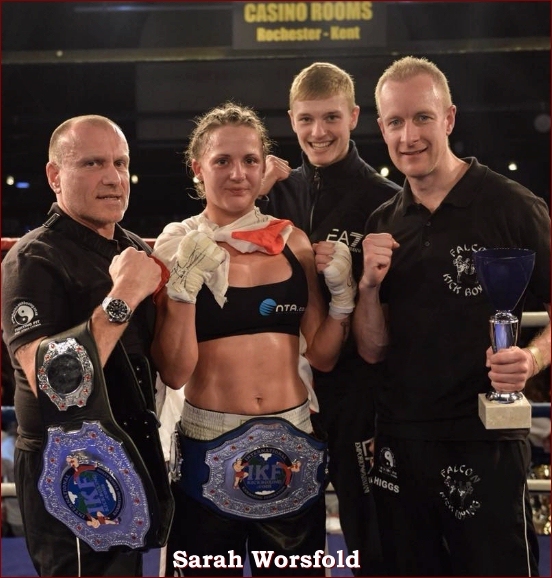 WINNER: Sarah Worsfold by unanimous decision, 50-45, 50-45, 50-45. WINNER: Freddie Fisher by split decision 48-47, 47-49, 49-46. WINNER: Anthony Kannike by unanimous decision, 30-27, 30-27, 30-27. WINNER: Kay Sumner by unanimous decision, 30-27, 30-27, 29-28. WINNER: Dave Izzard by unanimous decision, 29-28, 29-28, 29-28. WINNER: Chris Dickerill by split decision, 30-28, 28-29, 30-27. WINNER: Adam Carr by TKO at 1:46 of round 2. Luke Blair receives a 30 day IAB medical suspension until 16th April 2018. WINNER: Jamie Thompson by unanimous decision, 30-26, 30-26, 30-26. WINNER: Aaron Fox by split decision, 29-28, 30-27, 28-29. WINNER: Baris Ferah by majority decision, 29-29, 29-28, 29-28. WINNER: Gavin Jasper by split decision, 29-28, 28-29, 29-28. 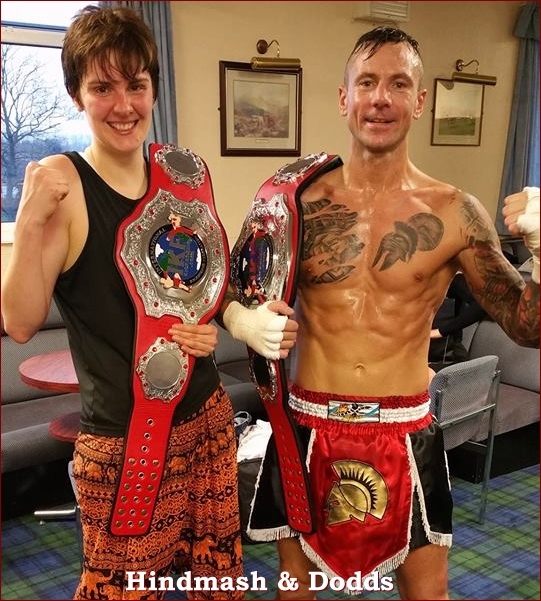 WINNER: Mitchell Forshaw by TKO at :40 seconds of round 2. James Springer receives a 30 day IAB medical suspension until 16th April 2018. WINNER: Rich Soxy Martin by RSF at 1:19 of round 3. Aaron Crooks receives a 30 day IAB medical suspension until 16th April 2018. WINNER: Katy Hughes by unanimous decision, 30-26, 30-26, 30-26. WINNER: Daniel Ratcliffe by unanimous decision, 40-34, 40-34, 40-34. WINNER: George Sharp by KO at :29 seconds of round 1. Paul Della receives a 45 day IKF medical suspension until 1st May 2018. WINNER: Ryan Fleming by RSF at 1:39 of round 2. Mark Cousins receives a 30 day IAB medical suspension until 16th April 2018. WINNER: Dean Little by split decision, 29-28, 28-29, 30-27. WINNER: Anthony Lane by unanimous decision, 30-27, 30-28, 30-27. WINNER: Angus Mclaren by DQ at :36 seconds of round 3. WINNER: Chris Wooten by corner retirement at the end of round 4. Alan Harris receives a 30 day IKF medical suspension until 16th April 2018. WINNER: Josh Cavey by TKO at 1:10 of round 2. Ricky Barnett receives a 30 day IAB medical suspension until 16th April 2018. WINNER: Liam Wells by RSF at 1:19 of round 2. Marcus Stephenson receives a 30 day IAB medical suspension until 16th April 2018. WINNER: Sonny Roberts by RSF at 1:40 of round 2. Sean Tormey receives a 30 day IAB medick suspension until 16th April 2018. WINNER: Shaun Mannix by unanimous decision, 40-36, 39-38, 40-36. WINNER: Stacey Dunn by corner retirement at the end of round 1. Craig Doughlin receives a 30 day IAB medical suspension until 16th April 2018. WINNER: Mason Roberts by unanimous decision, 29-27, 29-27, 30-28. IKF/ISCF/IAB Officials: Sean Toomey, Dan Chubb, Ed Smith, Matt Geere. 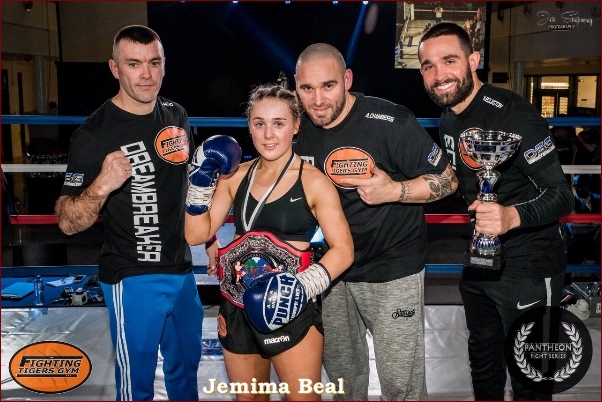 WINNER: Jemima Beal by unanimous decision, 49-44, 50-43, 50-43. 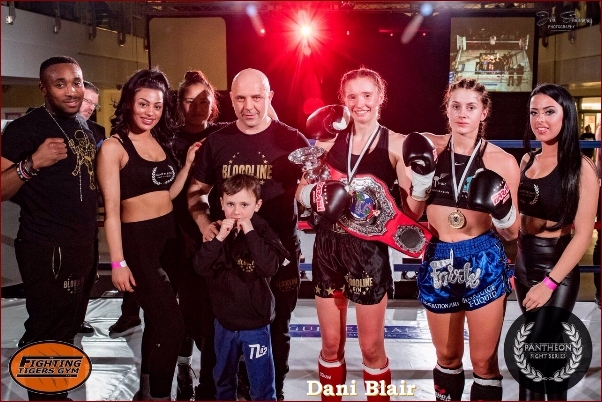 WINNER: Dani Blair by split decision, 48-47, 48-47, 46-49. RESULT: Split decision Draw, 48-47, 48-48, 47-50. 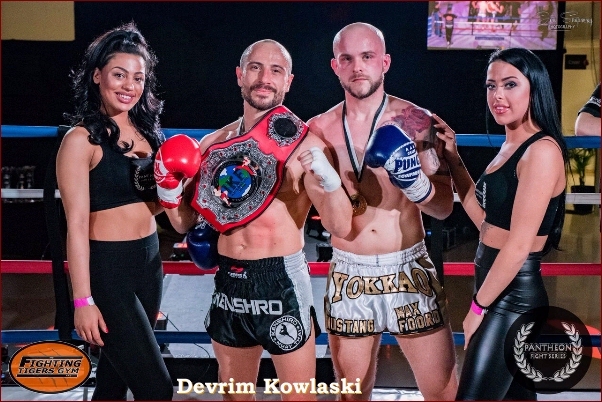 WINNER: Devrim Kowalski by TKO 1:32 round 2. Max Foord receives a 30 day IKF medical suspension until 2nd April 2018. WINNER: Henri Burnham by unanimous decision 48-46, 49-45, 48-46. WINNER: Steven Hill by G&P Stoppage at 2:03 of round 3. Fraser Cook receives a 30 day ISCF medical suspension until 2nd April 2018. WINNER: Marcel Adeyami by KO at 1:50 of round 1. Georgi Rodriguez receives a 45 day IKF medical suspension until 17th April 2018. 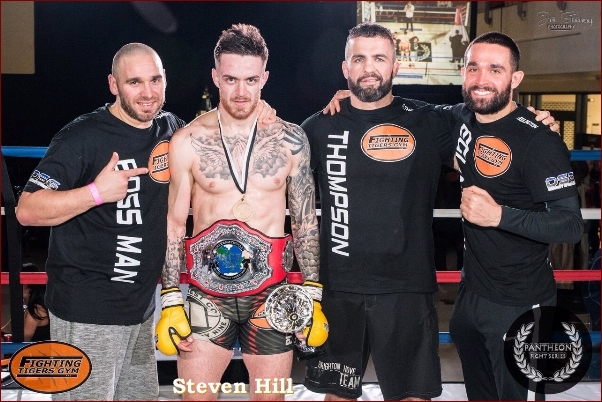 WINNER: Steve Keen by unanimous decision, 30-27, 29-28, 29-28. WINNER: Marcel Adeymi by TKO at 1:48 of round 1. Steve Keen receives a 30 day IKF medical suspension until 2nd April 2018. WINNER: Matt Plumstead by TKO at :42 seconds of round 3. Ron Tse receives a 30 day IKF medical suspension until 2nd April 2018. WINNER: Riyad Seudou by unanimous decision, 29-26, 29-26, 30-29. WINNER: Dan Mintern by TKO at 1:38 of round 2. Tom Brain receives a 30 day IAB medical suspension until 2nd April 2018. WINNER: Ashley Baldwin by TKO at :38 seconds of round 3. Jareth Mansfield receives a 30 day IAB medical suspension until 2nd April 2018. WINNER: Aaron Davies by unanimous decision, 30-26, 30-26, 30-26. 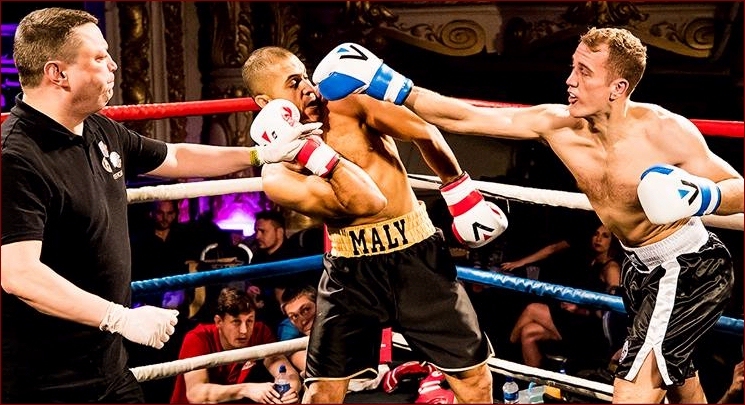 WINNER: Sueban Malik by unanimous decision, 30-27, 30-27, 30-27. 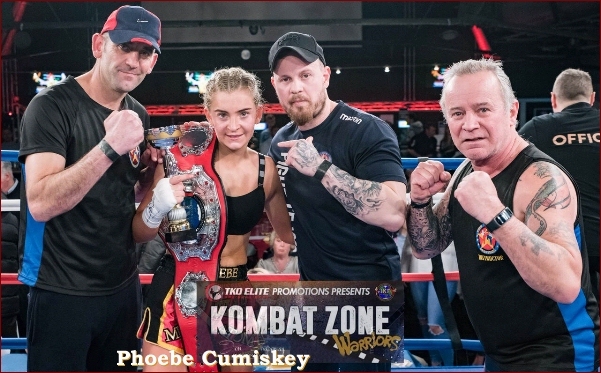 WINNER: Phoebe Cumiskey by unanimous decision, 50-45, 50-45, 50-45. 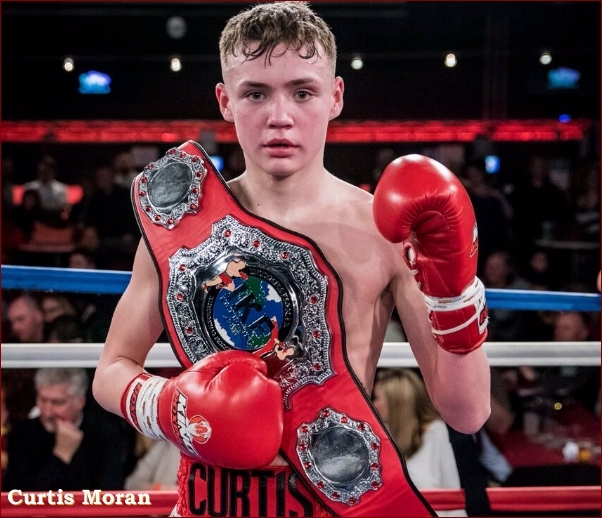 WINNER: Curtis Moran by RSF at 1:15 of round 3. Luke Wallace receives a 30 day IKF medical suspension until 27th March 2018. WINNER: Tommy West Jr by majority decision, 49-45, 49-45, 47-47. 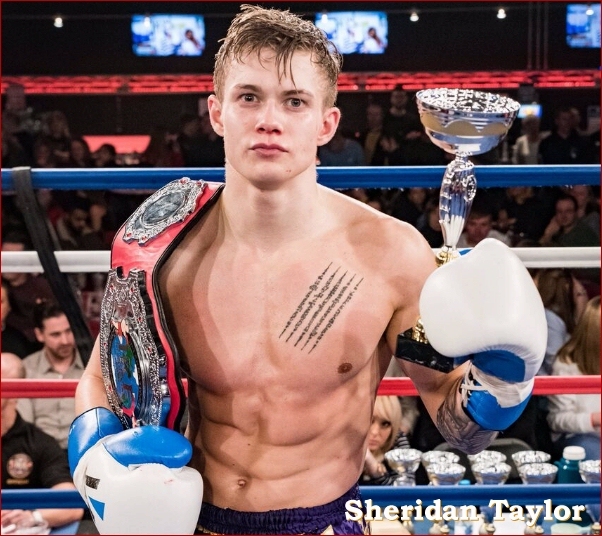 WINNER: Sheridan Taylor by majority decision, 49-45, 48-48, 49-46. WINNER: Adam Jensen by unanimous decision, 50-44, 48-45, 47-46. 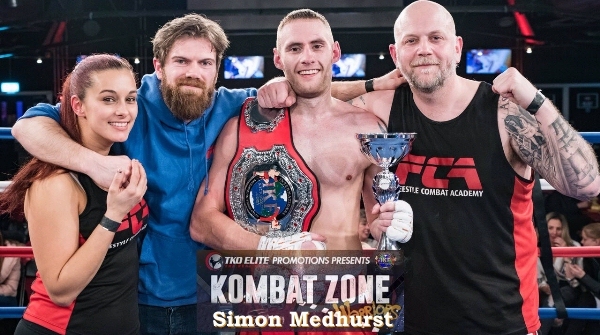 WINNER: Simon Medhurst by majority decision 49-48, 48-48, 48-47. 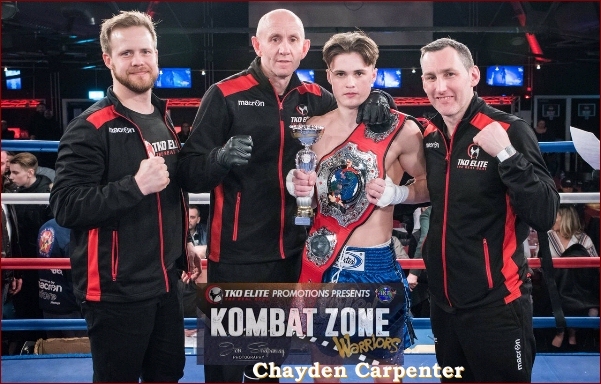 WINNER: Chayden Carpenter by KO at :50 seconds of round 1. Kraig Green receives a 45 day IKF medical suspension until 11th April 2018. WINNER: Connor George by split decision, 48-47, 50-45, 47-48. WINNER: Adis Mursados by split decision, 30-27, 30-28, 28-29. WINNER: Lily May Ridlay by unanimous decision 30-28, 29-28, 30-27. WINNER: George Savage by majority decision, 30-28, 30-30, 30-27. WINNER: Xavier Ralph by split decision 28-29, 30-27, 29-28. WINNER: Jack Lake by split decision, 28-29, 30-28, 29-28. WINNER: Jeevan Rakar by unanimous decision, 29-28, 29-28, 29-28. WINNER: Steve Martin by TKO at 1:18 of round 3. Matt Nicklin receives a 30 day IKF Medical suspension until 27th March 2018. WINNER: Aysil Garip by unanimous decision, 29-27, 30-27, 29-27. WINNER: Alex Gold by unanimous decision, 30-26, 30-26, 30-26. WINNER: Taylor Sellers by RSF at 1:40 of round 2. Callum Noviello receives a 30 day IKF medical suspension until 27th March 2018. WINNER: Tegan Hacker by TKO at 1:53 of round 2. Emma Ibrahim receives a 30 day IKF medical suspension until 27th March 2018. WINNER: Siobhan Keppler by unanimous decision, 30-27, 30-27, 30-27. WINNER: Safeerullah Safie by TKO at :30 seconds of round 1. Jermaine Robinson receives a 30 day IKF medical suspension until 27th March 2018. WINNER: Morgan Monk by RSF at :24 seconds of round 3. Kieran Thomas receives a 30 day medical suspension until 25th March 2018. Jason England receives 30 day IKF medical suspension until 25th March 2018. WINNER: Jamie Goff by G&P stoppage at 2:25 of round 2. Mike Fisher receives a 30 day ISCF medical suspension until 25th March 2018. WINNER: Thomas Tovey by G&P stoppage at 1:17 of round 1. Ricky George receives a 30 day ISCF medical suspension until 25th March 2018. WINNER: Sean Meaney by TKO at :22 seconds of round 1. James Myers receives a 30 day ISCF medical suspension until 25th March 2018. WINNER: Scott Pederson by split decision, 29-28, 28-29, 29-28. WINNER: Florian Aberger by unanimous decision, 29-28, 30-27, 29-28. WINNER: Ben Miles by unanimous decision, 29-28, 29-28, 30-27.